The Japanese Experience is an authoritative history of Japan from the sixth century to the present day. Only a writer of W.G. 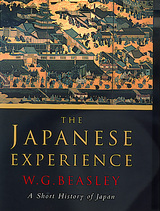 Beasley's stature could render Japan's complicated past so concisely and elegantly. This is the history of a society and a culture with a distinct sense of itself, one of the few nations never conquered by a foreign power in historic times (until the twentieth century) and the home of the longest-reigning imperial dynasty that still survives. The Japanese have always occupied part or all of the same territory, its borders defined by the sea. They have spoken and written a common language, (once it had taken firm shape in about the tenth century) and their population has been largely homogeneous, little touched by immigration except in very early periods. Yet Japanese society and culture have changed more through time than these statements seem to imply. Developments within Japan have been greatly influenced by ideas and institutions, art and literature, imported from elsewhere. In this work Beasley, a leading authority on Japan and the author of a number of acclaimed works on Japanese history, examines the changing society and culture of Japan and considers what, apart from the land and the people, is specifically Japanese about the history of Japan. The arrival of Buddhism in the sixth century brought a substantially Chinese-style society to Japan, not only in religion but in political institutions, writing system, and the lifestyle of the ruling class. By the eleventh century the Chinese element was waning and the country was entering a long and essentially "Japanese" feudal period—with two rulers, an emperor and a Shogun—which was to last until the nineteenth century. Under the Togukawa shogunate (1600-1868), Chinese culture enjoyed something of a renaissance, though popular culture owed more to Japanese urban taste and urban wealth. In 1868 the Meiji Restoration brought to power rulers dedicated to the pursuit of national wealth and strength, and Japan became a world power. Although a bid for empire ended in disaster, the years after 1945 saw an economic miracle that brought spectacular wealth to Japan and the Japanese people, as well as the westernization of much of Japanese life. W.G. Beasley is Professor Emeritus of the History of the Far East at the School of Oriental and African Studies, University of London. His books include The Modern History of Japan (1963), The Meiji Restoration (1972), and Japan Encounters the Barbarian: Japanese Travelers in America and Europe (1995).